Most of us probably first heard the epic six-part Johnny Cope as it opened Planxty’s third album, “Cold Blow and a Rainy Night”, but Johnny’s journey starts much earlier than that. The tune is strongly associated with Irish traditional music, but actually began life in Scotland. The song sung by Planxty originated with Adam Skivring, who wrote it in 1745 to lampoon Sir John Cope, commander-in-chief of the English forces in Scotland at the Battle of Prestonpans at the start of the 1745 Jacobite uprising, where he was very decisively defeated by Bonnie Prince Charlie. If the lyrics are any judge, he was more than a bit of a coward about the whole thing, although the court martial did find otherwise. There are opinions that the melody was derived from an even earlier tune, rather than composed by Skivring (see the Johnny Cope entry at the Traditional Tune Archive that references Samuel Bayard’s book Dance to the Fiddle). However, for the sake of containing the article, let us put this as the starting point of Johnny Cope’s march from Scotland. The trail of Johnny Cope’s passage can be traced to page 19 of the second volume of James Aird’s 1792 collection of Scotch, English, Irish, and Foreign Airs, where a four-part version is found that bears quite a strong resemblance to the current favourite setting. Aird published his collections in Glasgow, and prominence was given to Scottish melodies, and in addition the title refers to an event of significance to the Scottish, so the tune surely started life in Scotland. The question then becomes, how did this Scottish melody become so paradigmatically Irish? The tune shows up in one of the early Irish bagpipe music collections, O’Farrell’s Pocket Companion for the Irish or Union Pipes (“Being a Grand Selection of Favorite Tunes both Scotch and Irish etc”), in Vol 3, page 51, published between 1804 and 1810, where it is almost identical to the setting in Aird’s, and this may be the first instance of the tune found in a primarily Irish context. However, there was a lot of “borrowing” (nowadays we would likely call it plagiarism) and O’Farrell did label this one as “Scotch”, so it’s unlikely that it was thought of as Irish, yet. The melody appears again in Scotland, this time in the Edinburgh Repository of Music, vol 2 p. 30, published around 1818. This is once again a four-part setting, however there are significant differences, and especially the fourth part in this version has changed significantly. Back in Scotland we find the Ross’s Collection of Pipe Music, where a martial version of the melody is presented in five parts, published around 1869. Image 7. Hey! Johnnie Cope from Kerr’s Merry Melodies, vol 3, p. 41. In the 1880s, James Kerr published twelve volumes of music, four of them called Merry Melodies, which include jigs, reels, and other lively tunes. 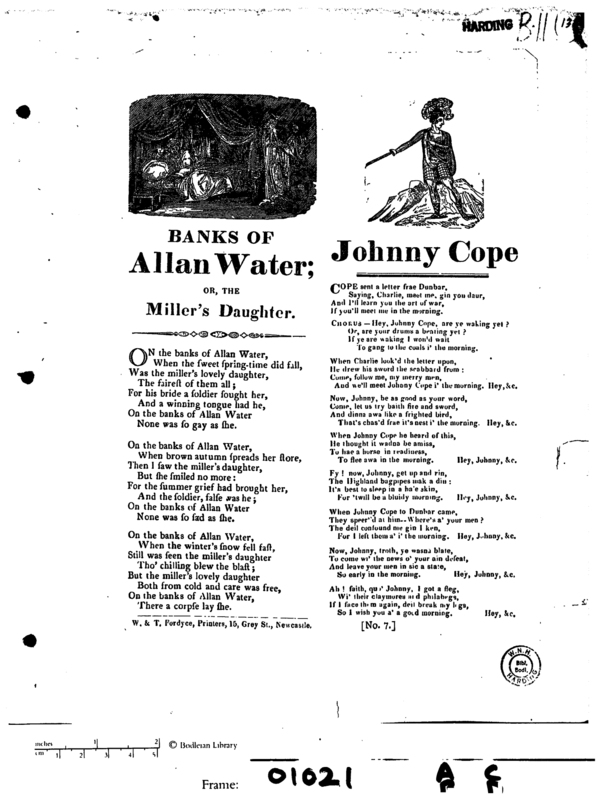 Volume 3 contains a two-part version of Johnny Cope. John Chambers’ has provided abc notation and kindly included a photo of the page on his website. Two additional Scottish versions are worth mentioning, from Köhler’s Violin Repository, vol. 1, p. 23 and p. 57, the first a two-part reel and the second a six-part tune just labeled “Variations”, published in 1881 in Edinburgh. I should clarify that I have found references to additional settings in other collections, but these are the ones I have been able to verify myself. We’ll now check back in with Irish music collections, and start with largest collector of Irish music, the Chief himself, Captain Francis O’Neill, collector of music, and Superintendent of the Chicago Police. In O’Neill’s Music of Ireland (published 1903) we find tucked away in the Marches and Miscellaneous section, #1812, p. 340, a curious two-part tune called Johnny Cope. In his Irish Music (published 1915 and arranged with piano harmonies), we find a reprint of a version published in a mysterious collection called The Repository of Scots & Irish Airs, with a note from O’Neill regarding the Irishness of the tune: “A footnote in Wood’s Songs of Scotland states that this old air originally consisted of one strain. The chorus or burden of a silly song, adapted to it was the first strain repeated an octave higher. The simple air although claimed as Scotch is in the Irish style and known all over Ireland. The above setting without the harmonization was copied from, ‘The Repository of Scots and Irish Airs’ – printed in 1799.” This setting is listed as being in March time. One of Chief O’Neill’s contemporaries was P. W. Joyce, and more information can be found about him at the Irish Traditional Music Archives. The ITMA has made tunes available from his “final manuscript”, which was found at his bedside at his death in 1914. Found within this collection was another four-part version of Johnny Cope. Also from the Irish Traditional Music Archives one more two-part version of Johnny Cope was found, this time coming from Roche’s Collection of Irish airs, marches & dance tunes, vol. 3, first published in 1912. This is the last version that I could find of Johnny Cope published prior to any recordings of Pádraig O’Keeffe. Pádraig O’Keeffe’s setting of Johnny Cope was published in Breandán Breathnach’s Ceol Rince na hEireann, vol 3. P. 95, #208 as notated from Sean Keane and in Johnny O’Leary of Sliabh Luachra p. 163, #285, edited by Terry Moylan. It was also found on the Comhaltas Traditional Music Archive, listed as being published in Treoir magazine in 1975 and again in 1997, and these sources are shown above. “Johnny Cope [hornpipe]” from The Sliabh Luachra Fiddle Master by Pádraig O’Keeffe. Recorded 1949, released 1993. Track 5 of 16. That’s enough for published scores, what about recorded sources? The first recording of the Irish version appears to be from Pádraig O’Keeffe, recorded by RTE in 1949. Subsequent recordings from Julia Clifford, Seamus Ennis, and eventually the recording by Planxty mentioned at the beginning of this essay have cemented the six-part O’Keeffe version as the definitive Irish Johnny Cope. Note that there are also many Scottish and Cape Breton recordings of versions of Johnny Cope, but for the sake of this article we’ll focus just on the Irish ones. (Well, with one exception which we’ll get to later.) A good listing of recordings of O’Keeffe’s version can be found at Alan Ng’s site, although he hasn’t indexed Planxty, and a listing of all included recordings of a tune by the name Johnny Cope can be found at thesession.org. Planxty’s recording might be the most widespread of the six-parter. Liam O’Flynn, the uilleann piper in the band, was good friends and roommates with Seamus Ennis, and there is a recording of Ennis playing this version, so it’s very likely that he got the tune directly from Ennis. The liner notes to that record mention that it was collected by Seamus Ennis from Pádraig O’Keeffe, so we can be pretty sure that he got the tune directly from O’Keeffe. This is also what Alan Ward wrote in his Music from Sliabh Luachra. So we can conclude that the six-parter came at least from Pádraig O’Keeffe, but we don’t know how it got to be in the form it is before his recording. There is speculation that O’Keeffe may have got the tune from his uncle Cal O’Callahan, either the full six parts, or a shorter version O’Keeffe then embellished. There also seems to have been a copy of Ryan’s Mammoth Collection and New and Scientific Self-instructing School for the Violin by George Saunders (published Boston in 1847) in the Sliabh Luachra area , so it’s reasonable to assume that there may well have been other collections circulating in the region from which O’Keeffe could have gotten either the full six parts or a shorter version. Unfortunately neither collection includes Johnny Cope (by that name), so they are not the proverbial smoking gun. Ward’s Music from Sliabh Luachra actually mentions that a musician named Joe Conway “played the standard march as a quadrille polka and the last two parts of Pádraig’s version as a barn dance which he named The Doon Roses”, which lends credence to the idea of embellishment. Further, it seems that O’Keeffe only ever wrote down a two-part version for students or as manuscripts, further influencing the idea that perhaps he (or his uncle) used creativity to arrive at the Big Tune. Patrick Cavanagh drew my attention to a recording of North Kerry fiddler Tom Barrett playing a local version of Johnny Cope that consists of two parts, the first of which is fairly similar to O’Keeffe’s fifth part, and the second of which only bears a passing resemblance to O’Keeffe’s second or third part. A very similar setting of Barrett’s tune is included in the reels section of Sliabh Luachra on Parade, p. 86, #166, as “The Far Away Boys”, published 1987. The tunes in this collection come from Cuz Teahan, and this one has the note “This is another very old piece”. It isn’t known when Barrett or Teahan first started playing or heard this tune and so it’s not known if this came before or after or at the same time as O’Keeffe’s version, however Teahan’s note leads me to suspect it is older. excerpt from “The Grand Ould Man/Johnnie Cope/Wrens Hornpipe” from Lios A’Cheoil by Tom And Kerry Barrett. 2002. Track 18 of 20. The above are what we can reference from printed and recorded sources, with published data to back it up. In other words, these are, as much as can be said for certain, the facts. So where did O’Keeffe’s version come from? Is the six-part an embellishment of the two-part tune or just a tangentially related version? What kind of a tune is it anyway? What follows is speculation and conjecture, or more favorably an educated opinion based on written scores… And the first thing to do is compare written sources to Pádraig’s setting. Let’s compare settings found in published sources with our O’Keeffe version, starting with the Aird/O’Farrell (we’ll call this the AF4) setting – these two settings are so close as to not be worth differentiating. This setting is almost in the same key (only lacking the F#), is in common time (4/4), and has quite a few similarities to O’Keeffe’s setting (let’s call it PK6 from now on). Comparing parts, we find that the first and second parts correspond fairly well to the first and second in PK6, and furthermore the third part corresponds pretty well to the fourth part in PK6. The last part in AF4 does not really match anything in PK6. Since there are no markings in either collection to indicate a rhythm, dance, or tune type, it can be guessed, but the melody and structure feel to me to be fairly march-like. Jumping out of order to Joyce, it can be seen that the setting found at his deathbed is note-for-note identical to that found in O’Farrell’s. Both O’Neill and Joyce copied tunes from older collections, so it seems likely that this setting is merely a copy of AF4, and in any case since this manuscript of Joyce was never published, it is not likely to have been the source for O’Keeffe. Moving back in order, to the Edinburgh Repository setting (ER4), we see that the setting has switched to 2/4 time, likely indicating or emphasizing the use as a march, and has some embellishments to make feel to have more of a melodic flow, but otherwise nearly identical to AF4 in the first and third parts, and only a bit more different in the second part. However, the fourth part of ER4 is what becomes interesting: the shape of this part follows very well the shape of the third part of PK6! Also interesting is the addition of some occasional F# accidentals in the second and fourth part. What about the Howe’s setting (HO8)? Despite having eight parts, to my ear this setting has less of a similarity to PK6. HO8 has a somewhat broadly similar first and second part, but these almost appear to be repeated as variations for the third and fourth part. The fifth part again seems almost a variation on the first part, and the sixth part finally changes to something new (corresponding to the fourth part of PK6 or third of AF4). The seventh part is also new, with possibly a hint of the fourth part of ER4, and the eighth part seems completely new, or maybe a heavy variation on the sixth part. The marking labels this an “English Air”, but this doesn’t really help categorize the tune. As an aside, these last two parts bring another tune to mind, the Drunken Sailor. And to add another (further) aside, the Groves Hornpipe is very close to being a major key version of the Drunken Sailor, and so may also be related to Johnny Cope. Chronologically, the next setting found was a five-parter in Ross’ Collection (RP5). Ross was a highland pipe major, so by inference the key of the setting is likely to be A mixolydian, as two sharps are assumed, but not written. The setting is essentially one part (the first) and three variations (second, fourth, and fifth) of that part, with a second part (the third) in the middle. The first and third correspond loosely to the first and third in AF4, but otherwise this setting appears to be departure away from PK6 rather than closer to it. The title is actually shown as Johnny Cope, March, and the structure definitely feels quite march-y; indeed certain features of the tune are reminiscent of another Scottish march, The Burning of the Piper’s Hut, if only slightly. Kerr’s Merry Melodies (KM2) is the first two-part setting found, despite O’Neill’s note about the original being one strain, but this may be due to holes in the research above. The KM2 setting is moved up to Bm, but otherwise corresponds reasonably well to the first two parts of AF4 and PK6. The endings of both parts show elaboration, and a similarity to the ending of the fourth part of HO8, which features a rising motif, but it doesn’t appear that this version has influenced PK6 at all. This brings us to Köhler’s settings, KR2 the two-parter and KR6 the six-parter both in G minor (aeolian). The KR2 version doesn’t appear directly related to Johnny Cope all that much, but it does seem similar to the Drunken Sailor. Curiously it’s also marked as composed by W. B. Laybourn. The KR6 setting at first glance also appears to be unique, but in fact is identical, after adjusting the key to match, to the last six parts of the setting in Howe’s. Additionally, the setting found in O’Neill’s Irish Music (ON6), also a six-parter, and also in G minor (aeolian), is almost exactly the same as KR6. This setting was copied from a publication O’Neill said was published in 1799, and it turns out to be The Repository of Scots & Irish Airs, Strathspeys, Reels &c. by John McFadyen, meaning this key and the six parts are older than HO8, strongly implying plagiarism (or copying) on the part of Köhler, but even more perplexingly, making one wonder what exactly W. B. Laybourn arranged. There is no marking for KR6, but O’Neill included the marking “March Time” for his setting. In any case, this setting is definitely from a Scottish source. You may recall I mentioned there would be one exception to recordings mentioned: Joseph Cormier, a Cape Breton fiddler, recorded a version of Johnny Cope in 1974, and was recorded again in 1990. His recorded version is almost note for note the version found in McFadyen’s and Köhler’s, and I believe this version is still known well in Cape Breton musical circles, as are a couple more. The Traditional Tune Archive includes a note that the setting in Köhler may have been the source or inspiration for Pádraig O’Keeffe, but to my ear they are not similar enough. The note continues and mentions that it may have been the inspiration for the Drunken Sailor – this is believable, as there are definite similarities, as I remarked upon above. There are two more printed settings to be examined – the curious two-part version tucked away in the march and miscellaneous section of O’Neill’s Music of Ireland (ON2) and the two-part version found in the Roche Collection (RC2). These versions are very different from the previous settings. The two settings are almost note-for-note identical, except that ON2 is notated with a key signature of A and RC2 of G, and the third last bar in the B part is slightly different. Both settings start with an E-A figure not found in previous settings of Johnny Cope and the B part is quite a bit different from anything found in other settings. Otherwise, there are apparent similarities in the A part, especially to KM2. This version is very similar to the polka recorded by Denis Doody (and more recently by Bryan O’Leary) in A dorian, which matches the key signature of RC2. Also of interest, the opening figure, and the shape of the A part, strongly suggest the Battle of Aughrim. Excerpt from “Johnny Cope’s/Din Tarrant’s [Polkas]” from Kerry music by Denis Doody. Released: 1978. Track 1 of 23. Image 15. A visual representation of similarities between parts of the various settings. Not much has been said so far about the fifth and sixth parts of PK6. Ward’s booklet makes reference to there being a standalone barndance of these two parts. However, there are similarities between these parts and the other parts of O’Keeffe’s setting. Image 16. Transcription of some parts of O’Keeffe’s setting. 1. O’Keeffe borrowed and modified some or all of the proto-barndance and/or modified the existing four parts of Johnny Cope enough to make the two “new” parts fit. 2. He created one or two new parts completely. 3. Or he happened upon a chance bit of the universe where coincidences happen and the existing tune just fit as-is. It’s also possible that someone else, such as perhaps his uncle, did any of those three things. Here’s where the really heavy speculation starts. To sum up all of the observations above: from Ward’s booklet and the Barrett recording, it seems that it could be possible that O’Keeffe used an existing barndance for one or both of the final two parts of his version. He could also have created one or both of those parts to suite the tune. There are enough similarities between the early four-part printed versions (especially ER4) to suggest that he got the first four parts of his setting either from a collection or transmitted via the oral tradition from a Scottish source. Cal O’Callahan’s sojourn to the U.S. may have been the source, or some other unknown collection may have given inspiration. There are enough differences to conclude that there was definitely an amount of creativity and variation at work, and it is my opinion that it was O’Keeffe’s creativity that made it his own, even while it’s also possible that he didn’t completely invent any of the source material. The only firm conclusion that can be made at this time is that the version we all know and love can be traced pretty conclusively from Planxty (and Liam O’Flynn), to Seamus Ennis, back to Pádraig O’Keeffe. One comment on the type of tune: Ward labeled Julia Clifford’s recording of PK6 as a hornpipe, but noted that it “is referred to as a hornpipe for convenience, though if Julia’s performance is anything to go by it would have been more for listening than dancing to.” Seamus Ennis’ and Planxty’s recordings are also classified as a hornpipe, but this may be simply for convenience as well. After listening to some of the other recorded versions I would conclude that this tune falls somewhere on a spectrum, sometimes closer to a march, sometimes maybe a barndance, and other times more decidedly as a hornpipe. Much information at the Traditional Tune Archive regarding Johnny Cope’s path through history is referenced from Samuel Bayard’s book Dance to the Fiddle. Since this book is a compilation of music from Pennsylvania, perhaps there is a link to be found between the story of Cal O’Callaghan and his stay in Ohio. There are also other collections of music where Johnny Cope may be found hiding that could shed more light (or just add more to the confusion) on the setting from O’Keeffe, as well. As they say, further research is needed. The name seems curious, but a case can be made that it refers to the small townland of Renasup, just a short walk up the road from Lisheen on the way to Glountane. This slide can be found by this name in Johnny O’Leary of Sliabh Luachra, but like many tunes, goes by other names as well: Bridgie the Weaver’s, The Barna, The Annablaha, The Kiskeam… and probably more besides.